Our light-coloured, spicy single-bock, “Vitus” is saturated with fine yeast and a creamy foam. It is a specialty with a round character based on the extra long storage time. The fruity smell of dried apricots joins aromas of citrus, cloves and hints of banana. Full-bodied and sparkling with an effervescent mouthfeel. Thus, the Vitus does not taste like a typical Bock beer but more like a noble, fruity wheat beer. Perfect with red meat, strong cheese and also able to guide desserts. 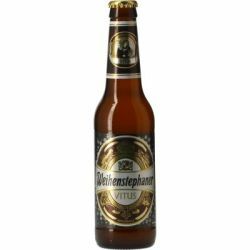 Brewed according to our centuries-old brewing tradition on the Weihenstephan hill. UPDATED: APR 17, 2019 Dorato chiaro, opalescente, con abbondantissimo cappello di schiuma bianca e dalla lunga tenuta. Al naso tanto fruttato (pera e banana) su una base maltata ben profumata. In bocca ancora tanta pera e banana, lieve speziatura. Risulta molto dolce ma grazie all'acidità dle grano risulta molto scorrevole. Corpo medio, non attenuatissimo, carbonazione spinta. note etiliche sul finale di bevuta. UPDATED: APR 4, 2019 Sweet, you can actually taste the sweetness. The after taste is very much like asian rice wine. Great beer! UPDATED: APR 1, 2019 50cl bottle from Abeervinum, Rimini, Italy. Pours classic hazy, orange gold, with a nice high and fluffy head of white foam, grossly grained. Aroma is intensely ripe banana. Body is average, like carbonation. Taste is moderately sweet but well balanced. Finish a little too sweetish, like candy. UPDATED: MAR 28, 2019 0,5l bottle from Prik&Tik Kampenhout. F: big, creamy, white, long lasting. C: blonde to pale gold, hazy. A: a lot of banana, bit clove, sweet floral, spicy, yeasty. T: wheat malty backbone, banana, clove, bit bubble gum, red apples, yeasty, bit vanilla, smooth mouthfeel, medium body and carbonation, bit mild alcohol, very nice balanced and fully enjoyable beer. UPDATED: MAR 26, 2019 Bottle pour. Hazy golden with a very large white foamy head. Strong aroma of bananas, bubblegum, and bread. Medium smooth body. Sweet with a tiny salty finish. UPDATED: MAR 22, 2019 Pours hazy yellow/orange with a very thick white head. Aroma of cloves. Taste is spiced and influenced by nutmeg. Palate contains coriander and nutmeg. Excellent. UPDATED: MAR 19, 2019 Bottle at home. Pours deep golden with thick white head. Nose is fruity, yeasty, big banana and bubblegum. Taste is bready, fruity, yeasty touch, nice bready-fruity finish. Light to medium body, soft to average carbonation. Yummy.